Remember how upset I was when lost my view of the Liver Building thanks to the construction of student accommodation opposite my apartment block? Well…I got a new view and it’s even better than the last one! 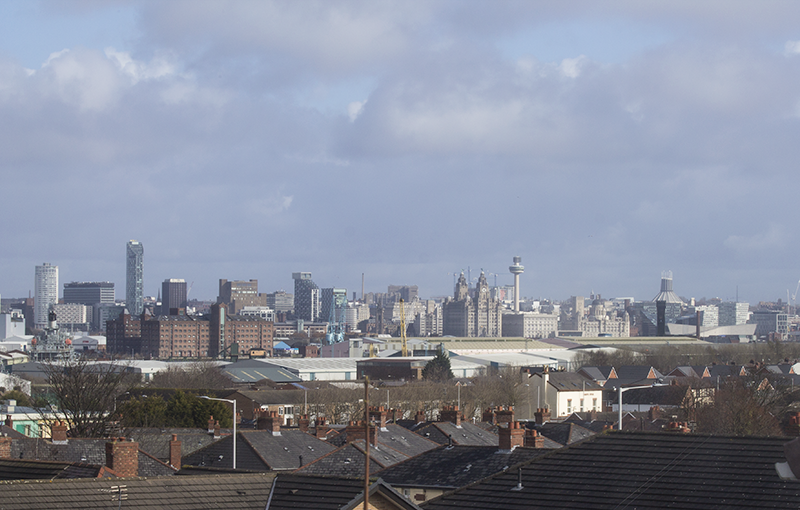 I can now see the entire skyline of Liverpool, including Goodison Park; the home of my football team, Everton. A new view means that, rather obviously, I have a new home. A house, to be precise. Last weekend Tyrone and I moved into a little semi-detached house across the river, and we’ve spent all of this week getting settled in our new home. The move couldn’t have gone better. There was a slight hiccup when the removal man we hired cancelled on us on the Tuesday before our move out day, but we managed to find another driver and he turned out to be a fraction of the price. And I really can’t fault the service he provided at all. He turned up on time, he took great care when packing our belongings away, and allowed us to ride in the van with him. So, if you need a man with the van in Liverpool or on the Wirral give me a shout and I’ll gladly give you his number. We were really grateful for Argos same day delivery and Amazon Prime Now which made our move even easier. We arrived at the house about 1pm and by 7pm we had a bed, a dining table and a microwave. Then, thanks to AO’s next day delivery, the washing machine and fridge freezer arrived the following morning (there was already an oven in the house). The one piece of furniture we haven’t got is a sofa, but that will be delivered in three weeks time (fingers crossed it fits through the door!). Our parents came to visit on the Sunday after we moved in to see the house and help out (i.e. supply me with rose wine and cake!) which we really appreciated. On Tuesday we went back to the flat to pick up some bits and bobs that we had left behind, and to ensure that it was nice and clean ready to hand the keys back. It maybe surprising to some to learn that I didn’t feel sad or upset as I closed the door on our flat; our first home together. I mean, I’ve cried when I’ve had to leave hotel rooms behind but I didn’t shed a single tear about saying goodbye to the flat. In fact, I felt nothing but pure joy. I closed the door on that chapter of our life and on all the unhappiness we had endured over the last 6 months. Onwards and upwards. I plan on writing a few posts about the house once we have everything sorted. We’re working on making it as homely as possible so there is still a lot to do. 🙂 Hope you enjoy the home-related posts! Thank you so much for this! I didn’t know the Wirral had so much to offer. We live just a short walk away from Birkenhead Park so I’d love to visit some time. I bet it will be really nice in the summer. I’ve also wanted to visit Port Sunlight for a while. I’ve passed through on the train and I think it looks so pretty. That’s a beautiful view. We can just see the other side of the street and some grass, so ours is nowhere near as good. It’s better than our last one though, which was the half of the pub they hadn’t made into flats, and loads of steel bars haha. It must be great to be so close to Liverpool still, as well. I keep moving further and further away from Leeds city centre, which is a pain when I want to collect my comics each week. Glad to hear you’re getting settled in your new home. It’s great that you weren’t sad about leaving the flat. I really miss ours and we were only there 6 months. Probably because I have to walk ALL THE WAY downstairs to get myself snacks on a night. Hopefully this will encourage a diet! Oh, and in reply to your comment, yes we are off to Liverpool! We’re just doing the Saturday and I can’t wait! I’ll be dressed as a Team Rocket grunt as I haven’t had time to make/fix any other costumes. The first time I went I didn’t dress up either, but I’d say it’s about 50/50 anyway. There’s a lot of people who just go for the stalls and to take photos with other cosplayers! Hope you enjoy it! At least your view has improved. In my first year of uni my view was a brick wall so anything is an improvement on that! I really like how close we are to the city centre still, and it also means I now live closer to the beach so it’s a win win situation. Woo! I might bump into you then. 🙂 I’m planning on taking my camera to take photos of cosplayers!